If investors hoped the biggest oil bust in decades would change the way oil industry executives are getting paid, they are probably disappointed. 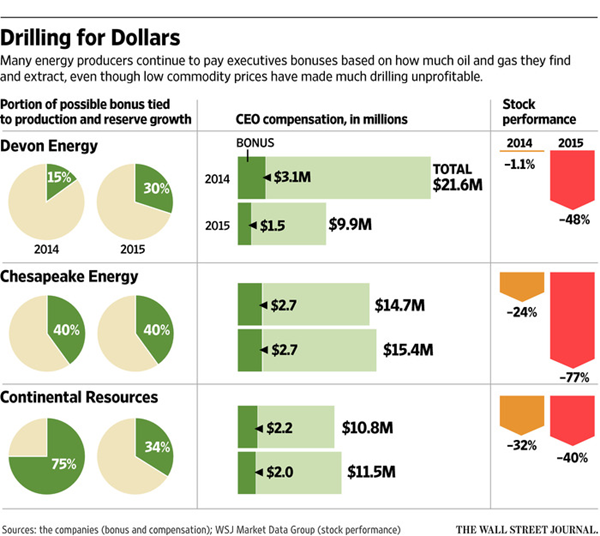 Many large production companies last year continued to incentivize their executives based, in large part, on how much crude they found and extracted, according to a Wall Street Journal review of filings from the largest U.S. energy producers. Executives received sizable cash bonuses for finding and producing more oil and gas than the year before, even though plummeting commodity prices made it unprofitable to keep drilling many wells. At Chesapeake Energy Corp., one of the country’s largest producers, Chief Executive Doug Lawler received $1.56 million last year for exceeding production and reserve targets, securities filings show. That was more than half his total bonus of $2.69 million, according to the filings. Chesapeake’s production rose 4.9% last year, more than twice its 2% target. But its earnings plummeted, and its stock lost 77%. A Chesapeake spokesman declined to comment. Mr. Grigel found that 14 of the 25 companies he studied either made no change in 2015, or didn’t disclose the details of their bonus calculations. Four companies increased their emphasis on production and reserve growth last year, while seven lessened the importance of these factors. Exploration and production companies in recent proxy filings have disclosed their formulas that determined last year’s cash bonuses. These will be followed by annual meetings, where shareholders will have a say on pay practices. Some corporate-governance observers warn that investors won’t tolerate big bonuses based on increased production if earnings and share prices are down. “Many shareholders hope that [bonuses] reflect the pain that investors are feeling in their portfolio values,” said John Roe, managing director at ISS Corporate Solutions, a unit of investment adviser Institutional Shareholder Services Inc.
Incentive pay in the oil patch helps explain why U.S. producers have been slow to dial down their output despite a global glut of crude and domestic natural-gas oversupply. U.S. oil production has declined about 7% since peaking at a four-decade high of about 9.7 million barrels last year. Natural-gas output, meanwhile, has remained on an upward trajectory despite a yearslong price slump. Rewarding executives for growth at any cost is rooted in Wall Street’s treatment of exploration and production shares as growth stocks. Since the advent of shale drilling more than a decade ago, analysts and investors tended to favor future prospects over profitability. The collapse in commodity prices has put that practice into question, though, as many companies struggle under debt they piled up acquiring land and drilling. Yet producers are hesitant to stop incentivizing growth all together. 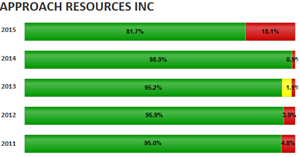 These companies’ borrowing abilities hinge on how much oil and gas they have discovered but not yet extracted and sold. If they don’t replace enough of the volumes they sell each year with new discoveries, they risk losing funding. Overall, bonuses, which usually account for less than a third of total compensation, broadly declined last year because low commodity prices crimped profits and sent stock prices tumbling. Continental Resources Inc., which drills in North Dakota and Oklahoma, reduced the weight given to production and reserve growth in its bonus math from 75% in 2014 to 34% last year, replacing its incentives to simply find more oil and gas with one aimed at keeping down the cost of doing so. Continental didn’t respond to requests for comment. Approach Resources Inc., which idled rigs on its West Texas drilling land last year in response to low oil prices, eliminated reserve and production targets. It increased the importance of capital efficiency and debt relative to profits. In 2014, production and reserve goals accounted for a quarter of possible bonuses. “We made the decision, given commodity prices, that what was more important was achieving attractive rates of return with shareholder capital, preserving balance-sheet liquidity and living within cash flow,” said Sergei Krylov, Approach’s finance chief. Devon Energy Corp. in its proxy filing urged shareholders to reject a shareholder proposal to eliminate reserve growth metrics from its bonus formula. “Exploring for and developing undiscovered oil and natural-gas reserves is fundamental to the company’s business and critical to its ability to build and sustain value,” Devon said. The Oklahoma City company made production and reserve growth each worth 15% of possible bonuses, up from 10% and 5%, respectively, in 2014. Though Devon exceeded its production target, low commodity prices prompted the company to write down the value of its drilling fields by $19.2 billion last year as many of its drilling properties became uneconomical. That led to a net reduction of reserves. 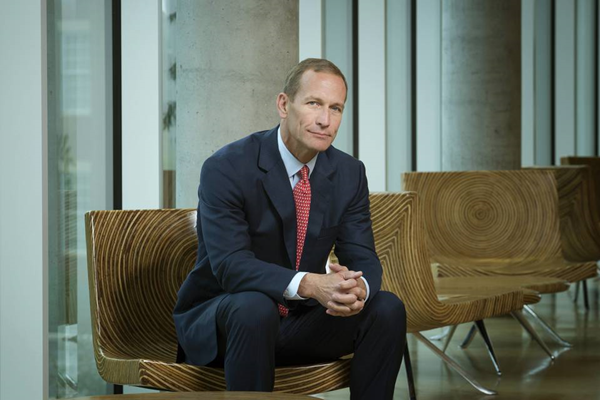 Missing its goal of adding the equivalent of 140.4 million barrels of oil to its reserves cost CEO David Hager more than $200,000, Devon’s proxy shows. Mr. Hager’s 2015 bonus was $1.55 million, about half what his predecessor earned the year before. 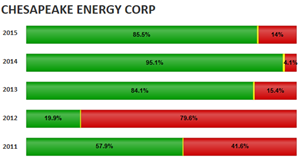 The following graphs are presented in the order of the article's reference to each company, and are linked to the relevant text. 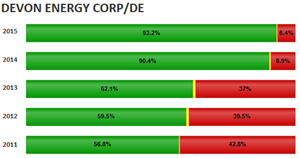 To view full-size graphs, and for graphs of other companies or indices, click here. 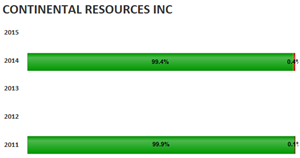 © Copyright 2012-2016 The Shareholder Forum, Inc.